I'm not sure why meaningless things like this fascinate me so much. I was doing some experimentation modeling how often offenses are normally able to score given the various down/distance/yard line combinations. I always plot the results to make sure they make sense. In this case I was looking at the probability of ending a drive with a made field goal in 2nd and 3rd down situations. (Second and third down modeling is especially challenging because there are fewer cases of each successive down. Plus there is an entire other dimension to consider--to-go distance. By comparison, first downs are almost always 10 yards to go.) After seeing the plots I thought there was clearly something wrong. You'd expect that having fewer yards to go would lead to scoring more often, but once you think about it that's not always true when looking at only field goals. 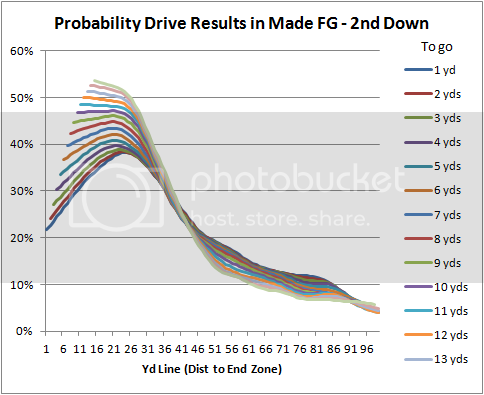 For most of the field, having fewer yards to go is better, but once a team passes a certain point, having more yards to go means it's more likely that a drive will stall inside field goal range. The interesting thing to me is the inflection point where all the to-go distance curves meet. At about the 40-yard line it's almost equally likely for all 2nd downs to lead to a field goal. At the opponent's 40, a 2nd and 1 and a 2nd and 15 would both lead to a made field goal about 25% of the time. The reason is far from mysterious. Second and long situations will tend to lead to 4th downs at the outside edge of field goal range, while 2nd and short situations will more often lead to conversions which will sometimes lead to touchdowns. 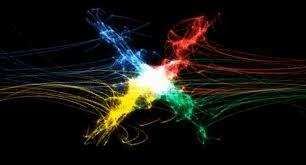 The same dynamic exists for 3rd downs, and the nexus is at the same location--near the 40. There are fewer 3rd downs than 2nd downs, so the curves are a little noisier, particularly at very long to-go distances. (The light lime green curve is for 15 yds to go.) You can still see a clear inversion of to-go distance likelihood for field goals. 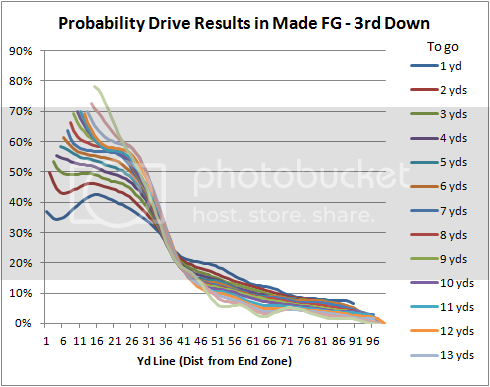 Scoring probabilities for 1st downs can be found here. 1st and 1? I must be at the nexus of the universe! Love the N1 graphic, lol!